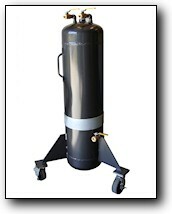 * High pressure refrigerants R12, R22, R134a, R500, R502. * Purifies in a single pass to ARI 700 standards. * Mobile, easy to move between locations. * Chilled water not required. * Transfer refrigerant and evacuate chiller system. 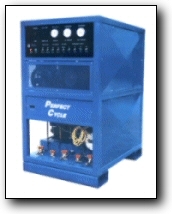 * Purifies dirty refrigerant - removes oil, acids, moisture. 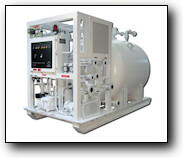 * Features - recovery, recycle, reclaim modes of operation. * Five 1/2 �inlet hose connections for multiple unit recovery. 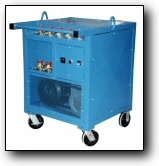 * Air cooled condenser, optional chilled water or refrigerated unit. 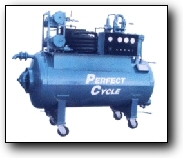 Ideal Users: Professional Recovery, Large Chiller Units, Volume Appliance Recovery. 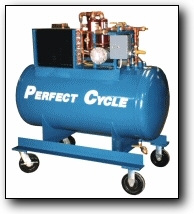 Ideal Users: Small to Medium Chiller Units, Appliance Recovery. * Class 1, Div 2, Group D.